Here is a charming, very well-illustrated article on American violinist Leonora Jackson (1879-1969). 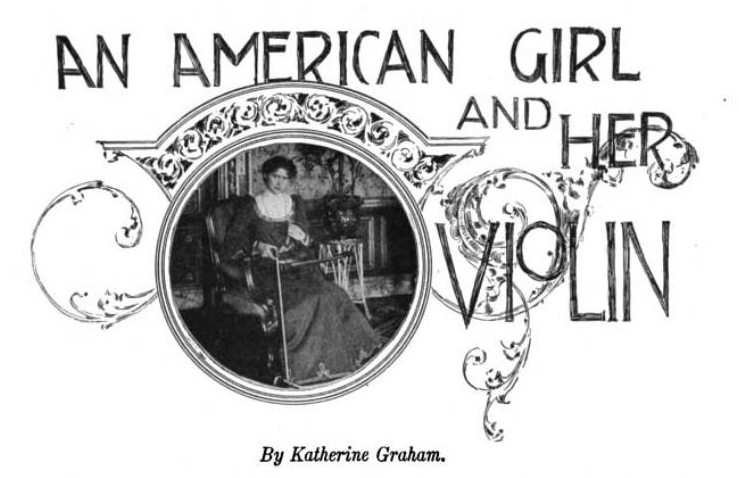 It is by Katherine Graham and is from the Metropolitan Magazine of March 1900. 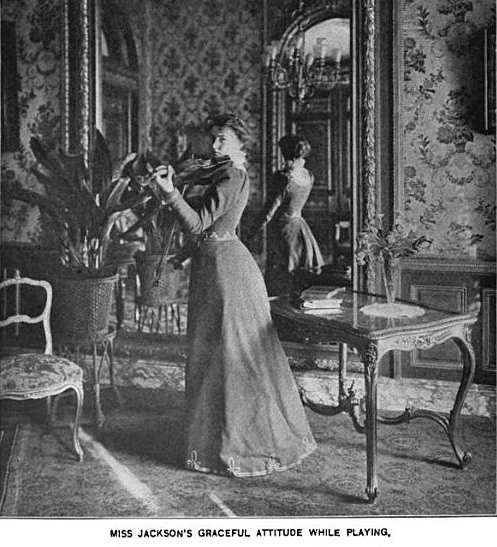 A slender girl, holding herself very straight after the manner of those who are students of the violin; in manners somewhat shrinking and diffident; a little defiant, perhaps, the better to conceal a natural timorousness at the sudden transition from the routine of study to the fierce light of publicity and unexpected fame – that is the picture. The long arms and large, powerful hands are curiously awkward, like those of an overgrown schoolboy; they seem lost and meaningless until they grasp the violin, when they become beautiful, womanly, and alert with nervous force. The face is replete with promise and interesting to a high degree. The eyes are long and narrow, with wide spacing; in contrast to the olive, colorless skin they look pale-blue, but in certain moods they deepen and glow and impress one as being black. The forehead and head are almost massive, giving a suggestion of delicacy and supersensitiveness to the mouth and chin – an impression altogether erroneous, for the lips are full, and the chin, if short, is broad and square. Such is the first impression of Leonora Jackson, the young American violinist, who in a career of only two years has scored triumph after triumph with every orchestral organization of importance in Europe, and of whom Dr. Richter has said: “A genius! – one not found in a thousand.” And the critics indorse him. 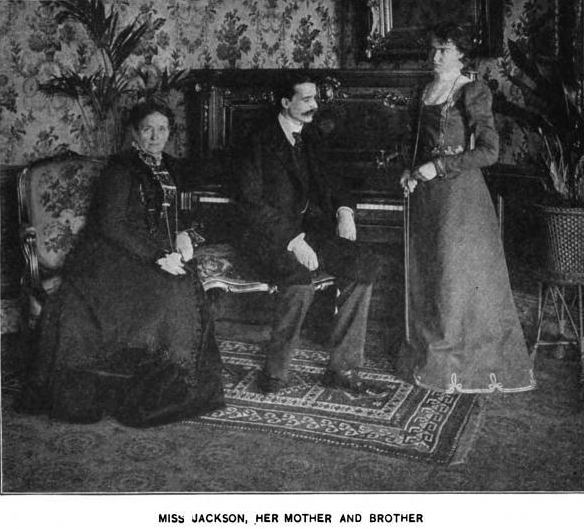 Although Mr. and Mrs. Jackson were married in California and are identified with the pioneer colony of that State, Leonora and Ernest, their two children, were born in Boston. The parents removed to Chicago while the children were still in their infancy, and it ws in the latter city that Leonora passed her childhood and early girlhood, and received her first violin lessons. At six years of age the child began to study seriously under the best masters the city afforded – Albert Ruff, Carl Becker, and Professor Jacobson. She made astonishing progress, and a brilliant future was predicted for her if she were sent abroad to pursue her studies. The child was taken to Paris and place under Professor Desjardins, of the Paris Conservatory. It was while in Paris, after her second year of study, that the shock came that changed Leonora Jackson from a merry, thoughtless child into a serious girl. News came that the entire fortune of the father was lost. Not a dollar remained. The son was taken from Harvard, and the mother and daughter, through the assistance of friends, returned home. For two years the girl struggled in this way to complete her education, notwithstanding the heavy strain on her body and mind. But her extraordinary talent forced recognition. When two wealthy women offered to pay her expenses abroad for four years, it was discovered that numbers of others insisted upon the privilege of sharing the expense. A subscription paper was started with twenty signatures representing six of the principal cities in the United States: New York, Chicago, Cincinnati, Philadelphia, Boston, and Washington. The fund arranged for four years’ study in Berlin under Joachim, and the purchase of a beautiful Storioni violin. In January, 1894, Mrs. Jackson, accompanied by her son and daughter Leonora, sailed for Europe. The outcome is well known. Miss Jackson made her début at the Berlin Philharmonic in the Brahms Concerto, Joachim himself leading the orchestra. 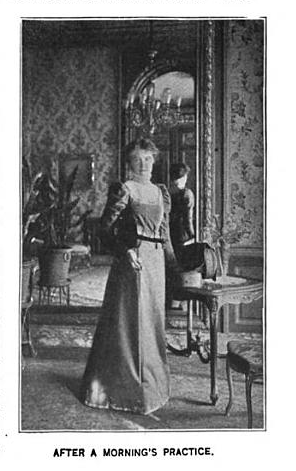 She was commanded to appear before the empress, and then followed a series of engagements under the distinguished orchestra leaders of Germany. That same year she won the coveted Mendelssohn prize of fifteen hundred marks. Her triumphs since then at the Colonne concert in Paris, at the Hallé orchestra in London, at Windsor before the queen, in Scotland, Belgium, and Geneva, followed by twenty orchestral engagements in America, have been repetitions of her great successes in Germany.